Travelling with a pre-schooler takes a lot more energy and patience than I imagined. The worst meltdown was on day 4 which lasted a good long 45 mins, I was lucky it happened in the hotel room. It was initiated from our train trip back from Bondi Junction and turned massive the moment she plonks herself down in the room. I did my best to control myself and keep breathing… “I want Mummy to hug me…“, that’s all we needed to get through the painful struggles. 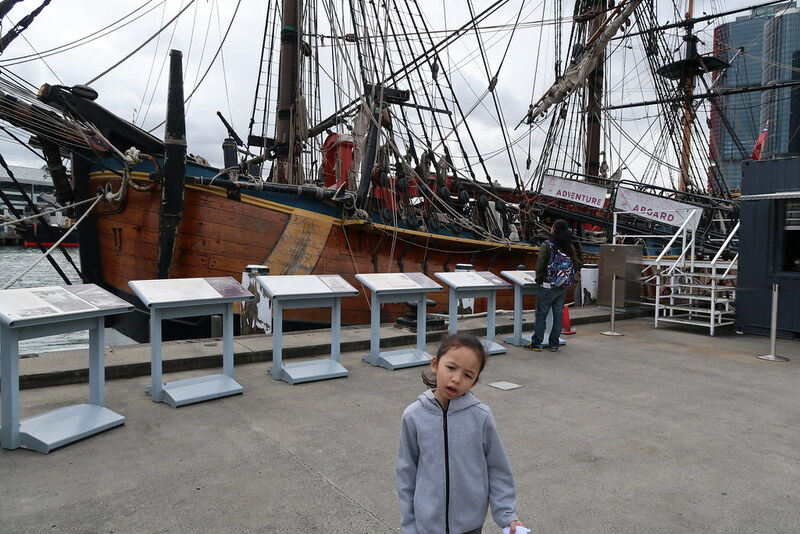 When a day tour is planned, prepare activities, for us, it would have been the iPad and food. Hungry and exhausted little one can really drive you crazy when stuck in an hour plus long bus journey. Unfortunately, I didn’t prepare either of them for our planned day tour, I had to pep talk every time we start our ride in the bus. I think I came up with 1001 reasons how we were going to have a great day if she would just rest and nap whenever possible. 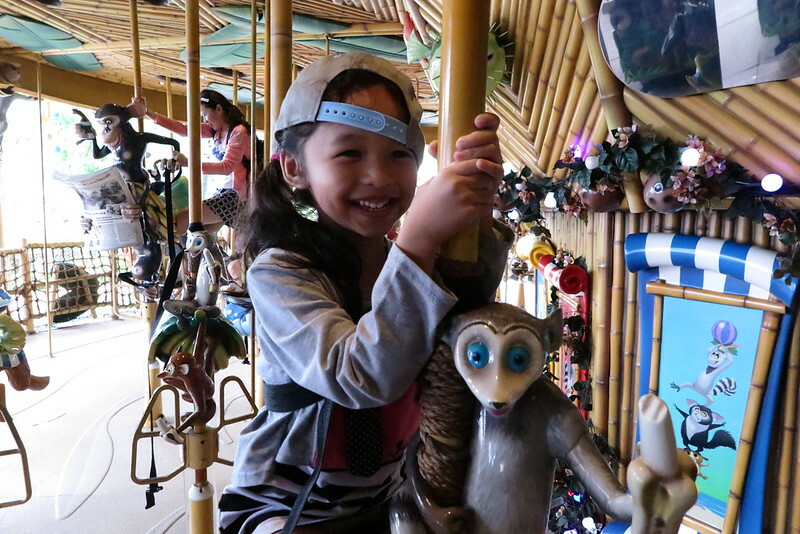 Don’t bother to plan an itinerary, what you do depends greatly on the mood of your pre-schooler. Just go with the flow and go slow, it’s ok you don’t get to visit every place you planned to. Avoid purchasing too many tickets before the trip and keep to just the main highlights, perhaps one attraction every two days. Never underestimate the weather… 11 degree is too cold for our summer-trained body. 3 layers and we were still shivering. Should have bought that Ultra Light Down from Uniqlo! And we almost hit our personal freezing point on the fourth night while walking back to our hotel from Darling Habour. When the little one made a promise, don’t take it seriously. “Ok fine! 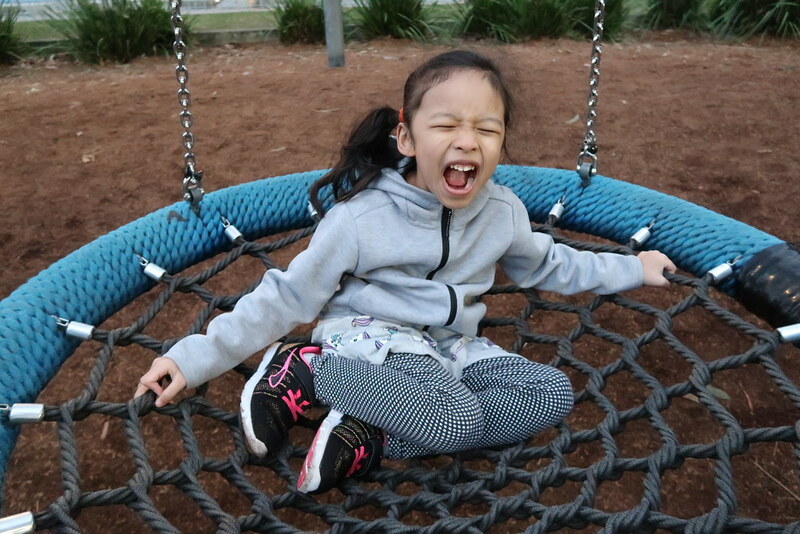 We go to the playground then we go dinner.” – Never happened. 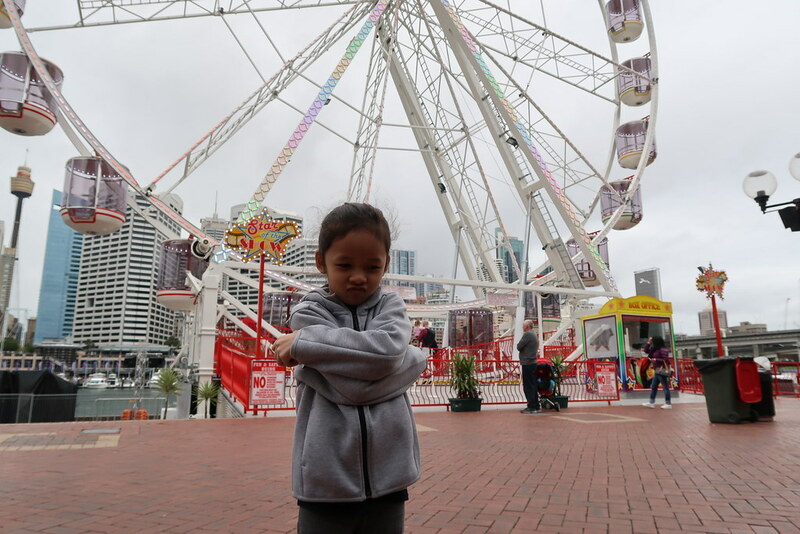 We ended up spending too much time at the playground and grabbing a quick bite from McDonald’s instead of a lovely dine in dinner by the harbour. Live in the moments for real and not just capturing and posting about it online. In the past, I used to have the habit to check my mobile and want to post everything I do instantly on Instagram. This trip, I make a conscious effort to keep my mobile away and focus on our time together. One hand holding onto my girl and the other my compact camera, we lived in every moment together and I capture shots and videos without putting in much thought or planning. Just turn on and shoot. Looking through the photos and videos captured, I double confirmed that perhaps all or most of the “Instagram-worthy” aka well framed and posed shots of kids travelling are lots of hard work and pep talk. Wouldn’t this be too much a hassle just to capture that one great shot? 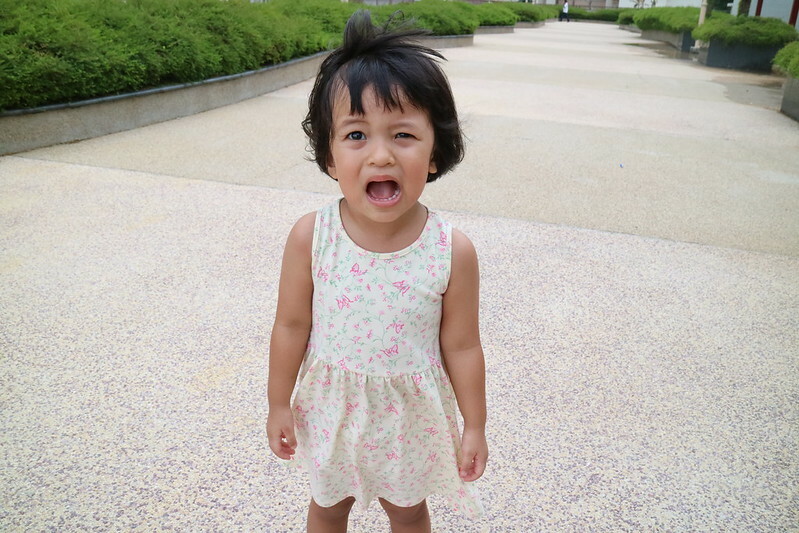 Unless of cos, your little ones are mini supermodels, well trained to respond to “Look here, smile (and pose)!” That’s exactly what I did too but it never worked on Ayra. Just look at the shots I got! Not happening! My girl is just as stubborn as the mother! 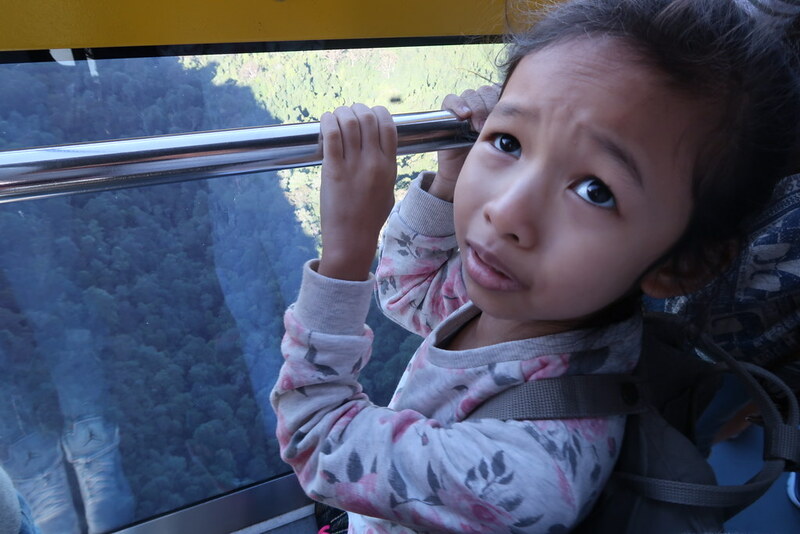 Ayra is very much like me when travelling – She keeps everyone in mind and ensures she buys something for each of them. At the shops, she’ll browse around and go… “This can give to my friends… this I think meimei (Zara) will like… hmmm I think I want to buy this for…“. 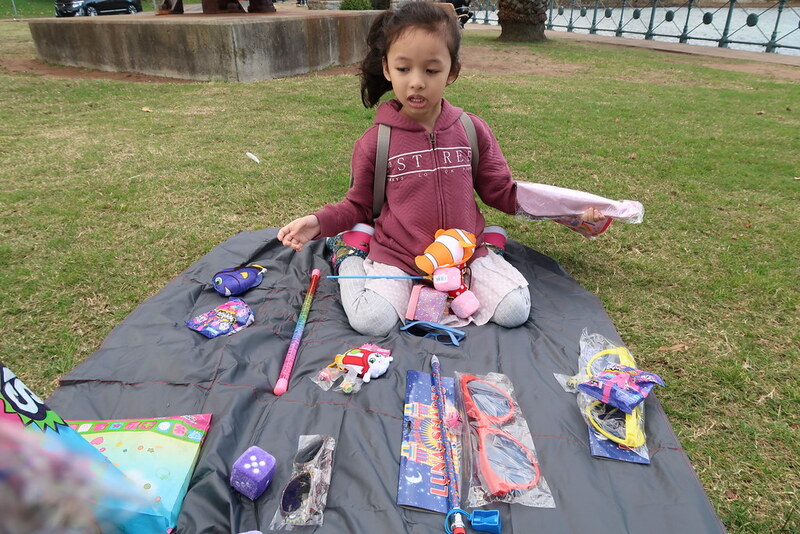 This is her distributing her loots after our trip at Luna Park. With one and a half day more to go, it’s time to get something for me perhaps? Ayra is very much like her father – the moment she stepped into the hotel room, she must have the TV turned on. And it is very difficult to get her to turn it off and head out! Always have a connection even if you plan to stay disconnected during travel. Because sharing moments and experiences with the sister back home is lots of fun via video calls. 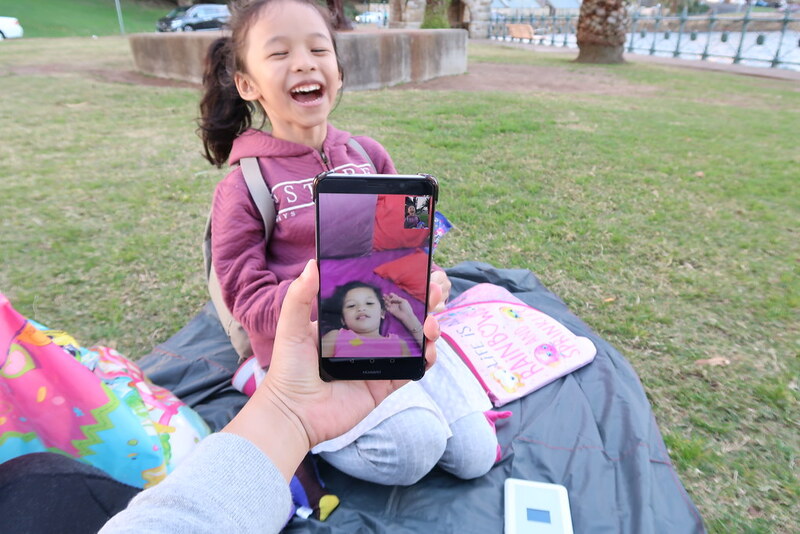 Every day we will stay connected with family back in Singapore via Whatsapp video call. Thanks to unlimited 4G Wifi powered by ChangiWifi (www.changirecommends.com), we called anytime anywhere without worrying we will exceed our data roaming or the need to top-up credits etc. 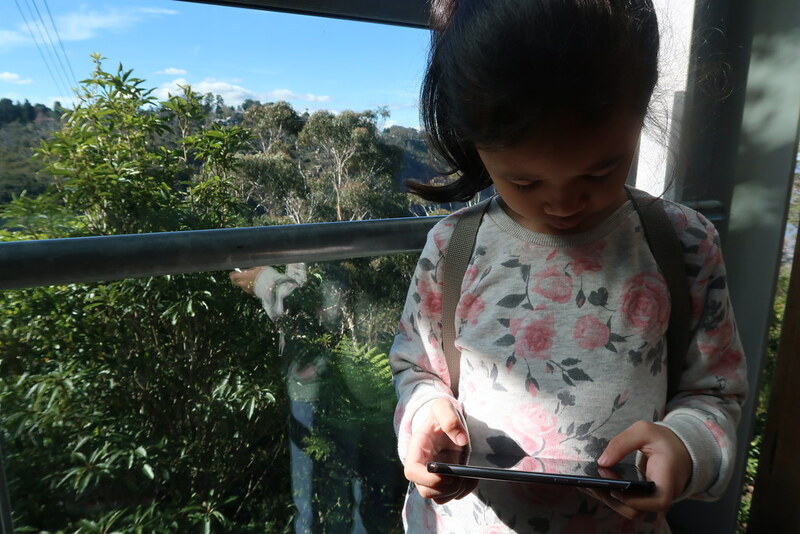 We shared our time on Blue Mountain, view of the Sydney Opera House, travelling in the double-decker train and a lot more happy times with our loved ones during this trip. With unlimited 4G Wifi also makes waiting in a queue a lot more bearable for the little one, who kept herself entertained with videos on YouTube. That’s us waiting in line for our Scenic Railway ride. Travelling could also be one of the best way to break a routine, like wanting milk in a bottle every morning and night. Or the need to hold a hanky to sleep. We survived so far, 5 Days 4 Nights, with Ayra and she has never asked for either of them. Not sure if she will start the routine again when we’re back, but I really hope she has grown out of it. We are on our final full day here in Sydney and will be flying back tomorrow afternoon. We both miss our family very much and Zara has been upset too without her sister around. Can’t wait to land back home and give a big warm hug to Zara! Have fun on your last day in Sydney! My in laws said it’s a cold winter this year – stay warm! 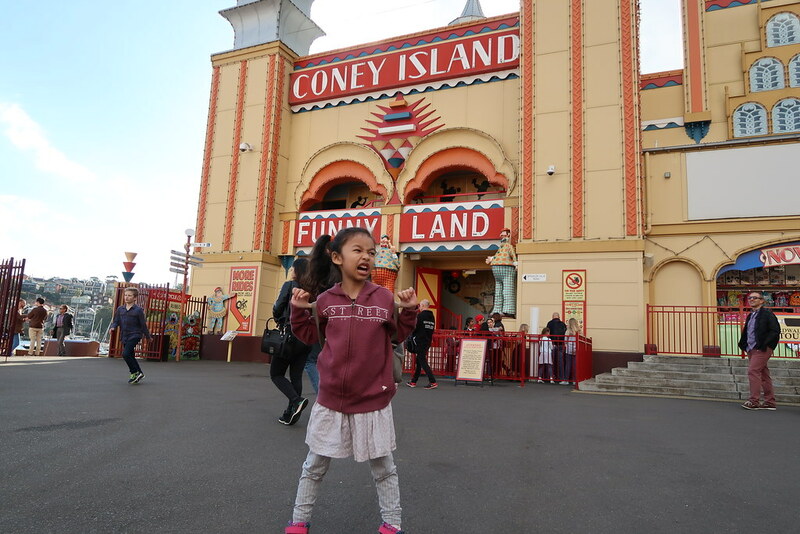 Wow what an interesting trip – I’m sure she’ll remember this solo trip with mummy for a long time! It’s never a relaxing holiday for mummy when travelling with kids – but it’ll certainly be memorable! Love the shots even though little one didn’t look happy. Because that’s her true feelings! I rarely post on the spot on social media when traveling and only do it after the trip or when kids are asleep so that I can focus on the moments I have with my family. That’s me lah 😉 but is great to be connected and share that very moment during the trip. A great adventure you have there! 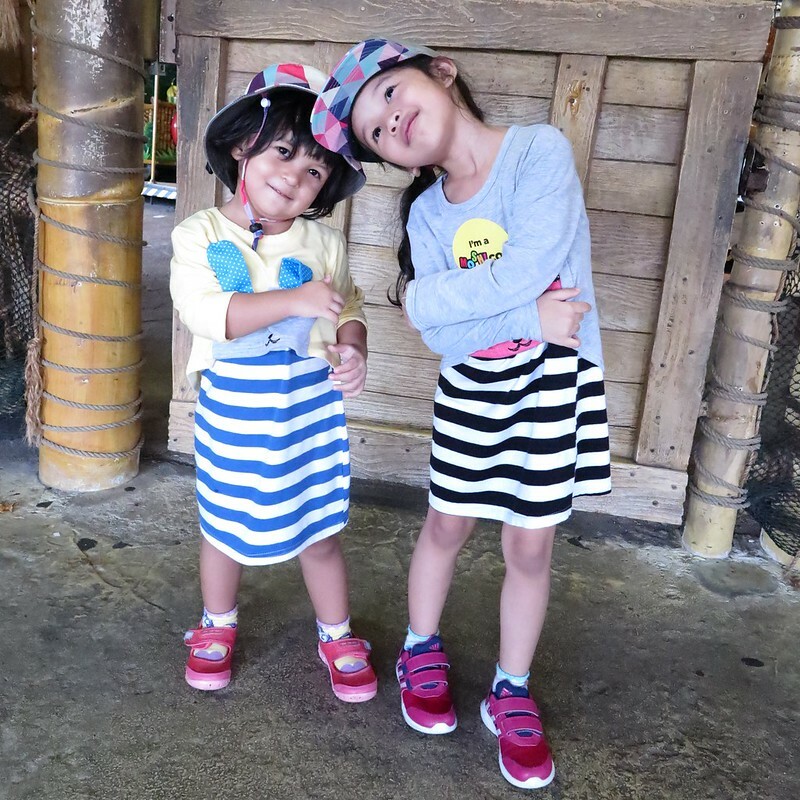 Wowww super mommy… Still holidaying n so tired, still got energy to blog? Kudos!!! Makes me appreciate my other half after reading ur blog post…Lols! Enjoy ur bonding time, it’s a blessing indeed. Must be very interesting experience!!! Thanks for the tips…Will use them if I dare to travel alone with kids. So finally you did it all alone and well-done dear. Personally, I have started liking the place where I am disconnected from social media. Looks like your girl enjoyed a very fun trip in Australia!